Inaugural annual lecture and iconic University Clock named after City alumnus who was one of the world's greatest watchmakers. On Wednesday 17th September, the life of one of the world's most important watchmakers was celebrated at City University London. In a distinguished career spanning six decades, George Daniels is famous for creating the co-axial escapement, one of the most important developments in horology within the last 250 years. Daniels studied horology at City's predecessor, the Northampton Institute. After his death in 2011, the George Daniels Educational Trust administered the substantial funds he bequeathed to provide scholarships for City's students and to benefit research in measurement and instrumentation at the University. The City celebration featured two events: the formal renaming of the iconic University Clock to the George Daniels Clock and the inaugural George Daniels Lecture, which was entitled "Optical Atomic Clocks: Light Years Ahead? ", delivered by Professor Patrick Gill of the National Physical Laboratory (NPL). 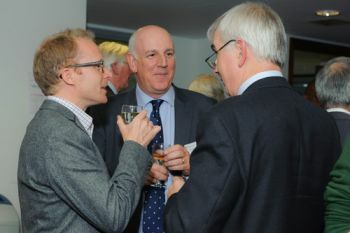 Last Wednesday's events brought together a variety of leading horological professionals, Trustees from the George Daniels Education Trust, liverymen from The Worshipful Company of Clockmakers and City academics, including Vice Chancellor, Professor Paul Curran and Professor Ken Grattan, the first ever George Daniels Professor of Scientific Instrumentation. 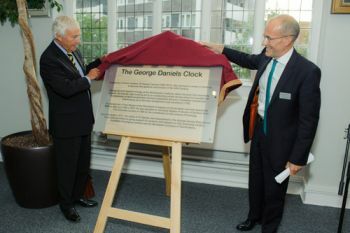 "Renaming the University Clock is a fitting tribute to Daniels, who studied here and went on to become the greatest watchmaker in the world". George Daniels still evokes warm memories among people who had a close professional working relationship with him, many of whom attended the events last week. Isle of Man based watchmaker, Roger Smith, who served his apprenticeship with the master horologist, noted that "George was a perfectionist in every way. He was very generous and gave me the opportunity to perfect my own skills." Andrew King, a liveryman of the Worshipful Company of Clockmakers, knew George Daniels for over twenty five years: "George was a very focussed man. His watches were of a consistently high quality. He knew exactly what he wanted to achieve and was painstaking in doing so." Michael Pearce, a Trustee of the George Daniels Education Trust, was also a neighbour and close friend of George on the Isle of Man. Pearce, who shared George's passion for vintage cars, remembers an "intrepid motorist who was fascinated by car engines and driving. After acquiring many of his motoring relics, George would meticulously dismantle the engines and put all the parts back together again." Professor Patrick Gill offered a fascinating glimpse into the future of horology in his talk entitled "Optical Clocks - Light Years Ahead". He demonstrated the connection between the precision of mechanical clocks - and the fine skills of a watchmaker such as George Daniels - and the use of techniques from advanced physics to create highly precise atomic clocks that have wide applications today and which show greater precision than conventional timepieces. 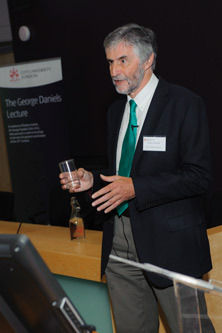 Among the modern applications of the techniques Professor Gill described were satellite navigation and GPS, as well as the Galileo and deep space missions, telecommunications, internet synchronisation, astronomy and surveying including star and planetary surveys. He also described the application of earth-based technologies such as power grid management and time-stamping with regard to financial trading.